For background information regarding the PORGY AND BESS GOES LATIN phase of our continuing theme of Jazz interpretations of the Gershwin opera, the editorial staff at JazzProfiles thought these insert notes from Nueva Manteca which was released by the Dutch-based Latin Jazz group in 1994 [Lucho 7714-2] might prove helpful. “The idea of performing the gorgeous songs from Gershwin's masterwork 'Porgy and Bess' in a jazz format has been realized often in a most convincing way. One only has to think of the deeply moving version by Ella Fitzgerald and Louis Armstrong with the Russ Garcia Orchestra or that other classic: The Miles Davis-Gil Evans collaboration. Remarkably enough a Porgy and Bess album has never been recorded in a Latin version. George Gershwin himself loved jazz and greatly admired Thomas 'Fats' Waller and Art Tatum. He also had a deep interest in what we nowadays call 'World Music'. In 1932 he embarked for Havana, Cuba. Enjoying the good life, Gershwin found Cuba 'most interesting, especially for its small dance orchestras who play most intricate rhythms most naturally', as he wrote to a friend upon his return. Inspired by his short visit to Cuba, Gershwin wrote the symphonic work 'Rumba'. According to his own words, in Rumba “... [he] endeavoured to combine the Cuban rhythms with his own original thematic material.” On the title page of the score Gershwin instructed that the players of four of the Cuban instruments he had brought back from Cuba — bongos, gui'ro, maracas and claves — should be placed in front of the conductor's stand, visible to the audience. In 1934 Gershwin made another field trip. This time he travelled from New York to Charleston, South Carolina. His purpose was to visit the setting of his opera 'Porgy and Bess'. He also wanted to meet the people about whom librettist, DuBose Heyward, had written. From Charleston, Gershwin took the ferry to Folly Island. This island belongs to the group of Georgia Sea Islands. The Afro-American inhabitants speak the Gullah dialect with a vocabulary comprising some four thousand words. This dialect seems of West African derivation. Although Gershwin found himself in a totally foreign environment far away from the glitter of Broadway, he immensely enjoyed 'going native' and immersed himself in the social and musical life. He frequently attended prayer meetings, participating in the so called 'Ring Shout'. The Ring Shout is a shuffling dance in anticlockwise direction accompanied by complex rhythmic patterns beaten out by feet and hands. Ring Shouts are a familiar characteristic of the 'Sanctified' and 'Pentecostal' churches and are believed to be derived from West African dances. The term 'shout' possibly stems from an Arabic word 'saut', said to be used by West African Muslim pilgrims to indicate the procession around the Kaaba [sacred Black Stone] in Mecca [Saudi Arabia]. Gershwin's friends discovered that the summer of 1934 spent on the Sea Islands was to the composer more like a homecoming than an exploration. The big city songs and the pulse of New York had found their counterpart in the haunting spirituals and body rhythms of the Gullah People. Gershwin had come under the spell of World Music, his masterworks 'Rumba' and 'Porgy and Bess' being the lasting reflection of it. SUITE PORGY AND BESS GO LATIN - All compositions by George Gershwin. All tracks arranged by Jan Laurens Hartong except nos. 2 & 6. 'Summertime' arranged by Ben van den Dungen. 'Bess, you is my woman now' arranged by Ben van den Dungen and Jarmo Hoogendijk. 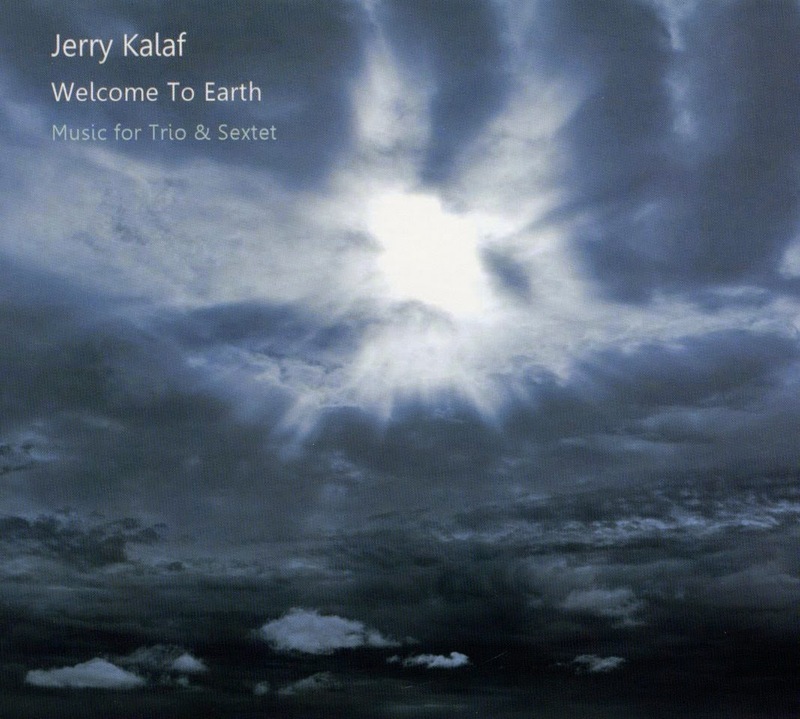 Jerry Kalaf - "Welcome to Earth: Music for Trio and Sextet"
Every so often, a CD comes along that reflects that sense of serenity that Jazz can evoke by emphasizing the quieting and peaceful effects of the music’s sonority. 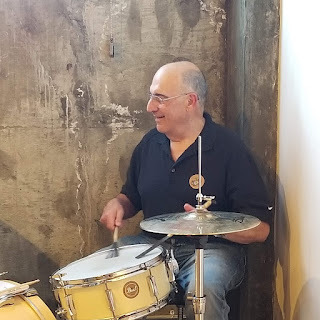 Such a recording was released on January 23, 2015 by Jerry Kalaf, a rare combination of a sensitive drummer who is also a talented composer-arranger [Dennis Mackrell also comes to mind, here]. 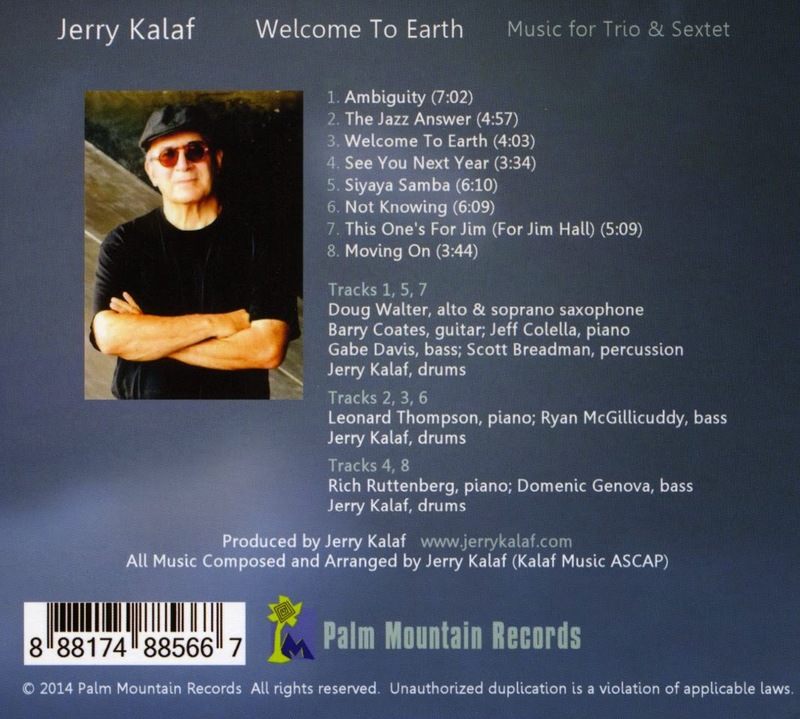 Jerry’s Welcome to Earth: Music for Trio and Sextet is on Palm Mountain Records [8 88174 88566 7] and you can find order information at www.jerrykalaf.com and through online vendors including Amazon, iTunes and CDBaby. The music on Welcome to Earth: Music for Trio and Sextet is the Jazz equivalent of a search for beauty and truth and as such it is an exploration that comes at the music in a way that is more gentle, introspective and probing. Jerry’s music gives you time to think; both while playing it and when listening to it. In this regard, it’s most telling composition may be This One’s For Jim - a piece that’s dedicated to the late guitarist Jim Hall who epitomized a subtle, smooth, delicate and refined approach to the music. If as Louis Armstrong maintained - “Jazz is who you are.” - then this music is Jerry Kalaf. Given the exquisite and intricate style of Jazz being played on Welcome to Earth: Music for Trio and Sextet, one would have thought that flutist and reed man Gary Foster would have found a place on this date. Instead, we find Gary contributing these insightful insert notes the the disc. 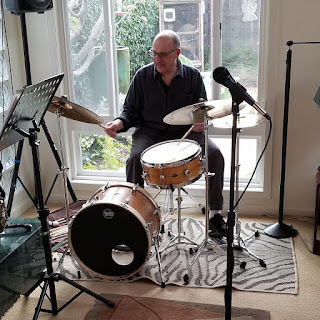 “Jerry Kalaf has been for many years a colleague from the "jazz wars," LA rehearsal bands, motion picture and recording orchestras, and many live performances. In 1998, Jerry and I played on pianist Gerard Hagen's CD, "Far Horizons." An arrangement of "You and the Night and the Music" was constructed on the spot We decided for variety that the drums and saxophone would improvise a chorus without the bass and piano. As we played our thirty-two-measure moment, I heard Jerry Kalaf the composer for the first time. Instead of a rhythmic solo, Jerry was hearing and playing from a harmonic understanding of the song. We have smiled about that moment many times over the years. The music presented here is a beautifully conceived and performed collection of Jerry's original compositions. The trio and sextet selections provide fine settings for the performers. Jerry's direct quote about the players heard here is perfect: “... with the exception of Gabe Davis, who is one of our new young artists here in LA, every musician on this recording goes way back with me." All are highly respected practitioners of what jazz great Lee Konitz calls "The Improvisers Art"
Featuring three different groups, the eight tracks on this recording elicit deeply personal responses from the musicians in how they approach Jerry's music. The stylistic contrast between "Ambiguity," "Moving On," and "See You Next Year" is dramatic. Listening to "See You Next Year" I made the note - Begs for a lyric! excellent documentation of Jerry Kalaf s musical life. - Gary Foster - Los Angeles - October 13th, 2014"
Holly Cooper and her fine team at Mouthpiece Music is handling the media distribution for the CD and she sent along another of her informative press releases which I have reproduced below to give you more information about Jerry and the musicians and music on the new CD. Welcome To Earth, the newest release by Jerry Kalaf, showcases the diverse talents of this multi-faceted, in-demand musician. A composer, arranger, and drummer, Kalaf's music - both his compositions and his drumming - can be heard on hundreds of recordings and soundtracks. Welcome To Earth comprises eight of Kalaf’s original compositions and features his long-time collaborators, who are some of the finest jazz musicians on the West Coast. The music is richly textured and lyrical, written with the individual styles of the musicians in mind and presented in a sextet and two different trio settings. Kalaf states, "My approach to composing can be termed absolute rather than programmatic. In other words, I usually don't draw from sources outside the music. I don't have a specific subject matter or imagery in mind; rather, I'm concerned with melody, harmony, and rhythm. I often think of the names only after the piece is written." Take, for example, Ambiguity. This is one of the three sextet pieces on this disc that features Doug Walter on alto sax, Barry Coates on guitar, Jeff Colella on piano, Gabe Davis on bass, Scott Breadman on percussion, and Kalaf on drums. It's based on three major 7th intervals that Kalaf incorporates throughout the tune, giving it an ambiguous harmonic but atmospheric feel, and, hence, its name. Siyaya Samba and This One's For Jim are the other two sextet pieces. Siyaya Samba is a beautiful melody inspired by the Zimbabwean musical, dance and theatrical group Siyaya, that Kalaf met on a State Department sponsored tour of Africa. This One's For Jim, which Kalaf dedicates to Jim Hall, moves through different rhythmic concepts and was arranged to highlight the distinct solo styles of Colella, Coates, and Breadman. Leonard Thompson on piano, Ryan McGillicuddy on bass, and Kalaf on drums perform together on The Jazz Answer, a tune inspired by Bill Evans. In this piece, every measure can be interpreted as having a new key center, creating a complex but very approachable harmonic feel. This trio also performs together on Not Knowing, an Oliver Nelson inspired waltz that's reminiscent of "Stolen Moments" that Kalaf takes to a whole new place, and Welcome To Earth, which Kalaf titled for his new grandson. This tune is constructed in six bar phrases that grow increasingly more complex. See You Next Year and Moving On feature Rich Ruttenberg on piano, Domenic Genova on bass, and Kalaf. As a composer, Kalaf cites Bill Evans as one of his inspirations, which is apparent on See You Next Year, a highly engaging jazz waltz with a Bill Evans vibe. Kalaf and Ruttenberg have worked together on many projects over the years, and in this piece, Kalaf wanted to capture Ruttenberg's languorous style, wherein the notes feel like they resonate longer than they actually do. Moving On, which Kalaf wrote specifically to end the CD, is a wonderful vehicle for Ruttenberg and gives the project a resting place and a sense of completion. Jerry Kalaf grew up in Binghamtom, New York, but has been a long-time resident of Los Angeles. Welcome To Earth is his fourth CD as a leader. It follows Noche, which features all original music by Kalaf performed by five pianists and four bassists in different trio settings, and Just Like Old Times, another recording of Kalaf s original music, with Rich Ruttenberg, Tom Warrington on bass and string arrangements by Doug Walter. Trio Music is Kalafs first CD as a leader and showcases eight of his compositions and one jazz standard. Rich Eames is on piano and Tom Warrington and Eric Ajaye share the bass chair. Although there are three different bands on this project, there is an overarching sensibility and tone created by Kalaf's gorgeous melodies and the strong backbone provided by his drumming. His compositional talents and affinity for his fellow musicians create a seamless framework for the interplay of their individual styles. The result is an elegant work that is both meditative and compelling. Kalaf has toured and recorded with some of the biggest names in music, including Eddie Harris, Gary Burton, Gary Foster, Frank Strazzeri, Bill Mays, Bill Perkins, Jimmy Cleveland, The Pointer Sisters, Gregory Hines and Major Holley, among many others. He has been active for many years in movie and television studios. His performances and compositions can be heard on literally hundreds of soundtracks, including Batman Forever, Captain America, Demolition Man, Heat, Girls, In Living Color, He's Just Not That Into You, and many, many more. Kalaf is also a highly respected educator and teaches jazz percussion at the prestigious and highly selective Colburn School in Los Angeles. 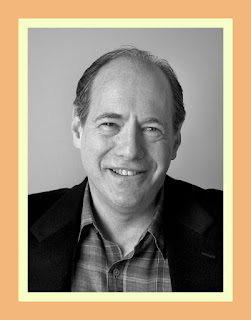 He's also a recording engineer with his own studio, Studio J, which specializes in trio recordings. You can sample Kalaf’s work from Welcome To Earth on this Soundcloud audio-only track featuring Ambiguity. 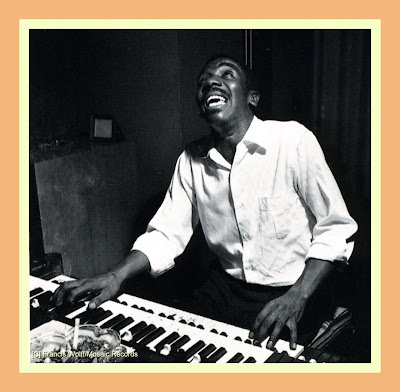 I wanted to expand a bit upon an earlier posting about Jimmy Smith to underscore how great his accomplishment was in bringing Jazz to the Hammond B-3 organ. © -Hammond Times, copyright protected; all rights reserved. “I never did take lessons, just taught myself. First, I learned about the drawbars and what each one stood for. As time passed, I experimented trying out all the different sounds. Next came the presets. I tried them out too but I don't use them very much except when playing ballads or something sweet and soft. When it came to the foot pedals, I made a chart of them and put it on the wall in front of me so I wouldn't have to look down. My first method was just using the toe. In the earlier days I was a tap dancer so the transition to heel and toe playing was made without too much trouble. One thing I learned was that you have to have a relaxed ankle. I would write out different bass lines to try for different tempi in order to relax the ankle. One useful learning technique was to put my favorite records on and then play the bass line along with them to see if I could play the pedals without looking down and only occasionally using my chart on the wall. This worked out fine. © -Kenny Mathieson/Canongate Books, copyright protected; all rights reserved. In musical terms, … Smith … is the key figure in the evolution of the Hammond organ as a jazz instrument. As he says, the electric organ had been used in jazz before he first took it up, either on an occasional basis by the likes of Fats Waller and Count Basic, or more regularly by musicians like Glenn Hardman, Doggett, Buckner and Davis. It was Smith, though, who brought the instrument to genuine prominence in a series of recordings for Blue Note in the late 1950s, and established it as a central jazz voice rather than an occasional novelty. Given that he had no instruction, the speed with which he had mastered the instrument by the time of his recording debut early in 1956 was a formidable achievement in itself, regardless of when he started. The Hammond B-3 organ offered several advantages to the jazz player. Waller and Basic had played and recorded on fixed pipe organs, but the Hammond was relatively portable, although anyone who has ever been lured into helping move one will know that relatively is the correct word. Laurens Hammond had begun manufacturing the instrument in Chicago in 1935, and used a system of rotating steel tone wheels and an electromagnetic pickup to generate both the notes and the additional overtone pitches controlled by the drawbars above the two sets of keyboards (technically, organ keyboards are know as 'manuals'). The introduction of the rotating Leslie speaker in the early 1940s, combined with developments in the Hammond itself (notably the introduction of a percussion stop), helped provide the instrument with its characteristic tremolo sound. Later innovations introduced more technically advanced electronic attributes which eventually led to the tone wheel system becoming obsolete, but the tone wheel models have a distinctive weight and character to their sound which is much sought after, and the Hammond B-3 has remained the classic instrument of choice for jazz players. Smith achieved a new musical synthesis on the instrument, and took the playing techniques to unprecedented levels. He developed a style which allowed him to play walking bass lines with his feet on the pedals, while playing chordal accompaniment with his left hand, and fleet, single-line melodies (or additional chord punctuations) with his right. The freedom to supply his own independent bass lines obviated the need for a bass player, and he formed what would become the archetypal soul jazz unit in 1955, a trio with organ, guitar and drums (a saxophone, usually tenor, was the optional extra in the equation). His music brought together elements from bebop and swing with blues and rhythm and blues, while the Hammond, which was widely used in black churches, lent itself particularly well to the gospel elements which infused hard bop and especially soul jazz. The combination would prove irresistible. The organ trio flourished in black clubs and bars, and eventually became one of the most popular of all jazz formats. 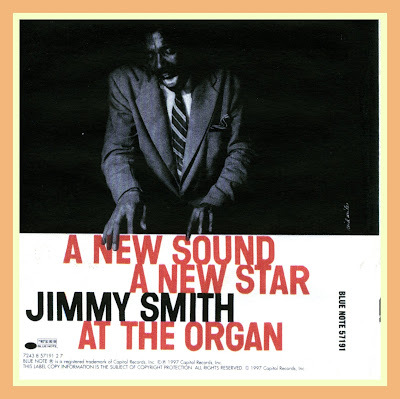 Blue Note lost no time in taking Smith into the studio for the first time in February, 1956, and made it clear that their new signing was something special, issuing his debut album under the emphatic title of A New Sound - A New Star: Jimmy Smith At The Organ. 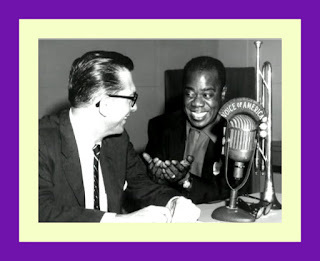 The first volume, with Thornel Schwartz on guitar and drummer Bay Perry, contained Smith's version of 'The Preacher' and a blistering version of that great jam session perennial, ‘Lady, Be Good', while Volume 2, recorded in March with Donald Bailey taking over the drum chair, opened with an even more famous version of Dizzy Gillespie's The Champ'. The best of this up-tempo material has a raw excitement which still shines through (the ballads are rather overwrought), while Smith's extraordinary facility is matched by a genuine improvisational flair. Schwarz sounds a shade uncomfort­able when soloing at these speeds, and comes across as rather tame by comparison with the pyrotechnics erupting from the organ. 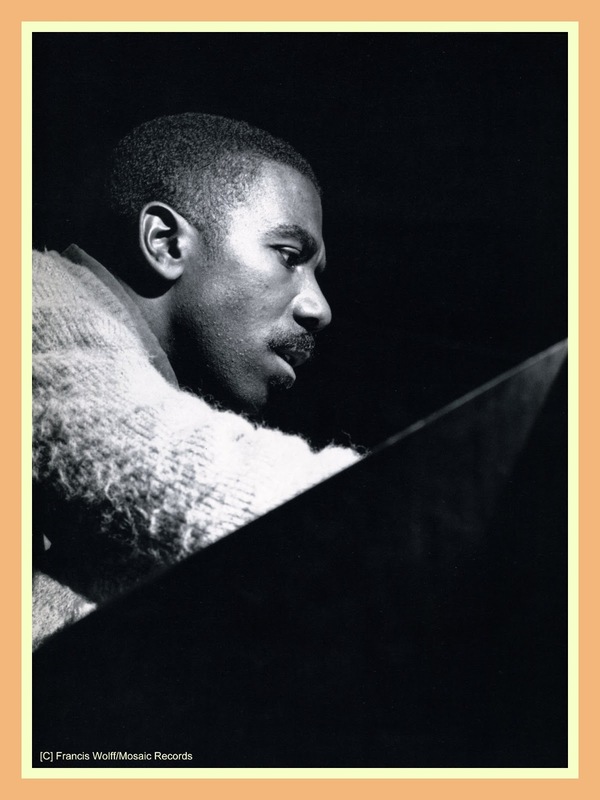 Michael Cuscuna offered a succinct synopsis of Jimmy Smith’s rise to celebrity status in the Jazz world and his early years at Blue Note in the following insert notes to Jimmy’s Cool Blues Blue Note CD [7243 5 35587 2 7]. They are reprinted below with his permission. © - Michael Cuscuna, used with permission; copyright protected; all rights reserved. 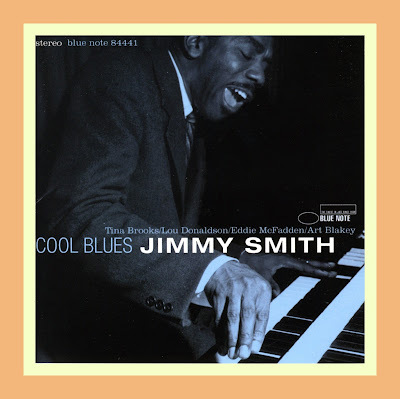 “Jimmy Smith's story is an unusual one because he single-handedly intro­duced an instrument into the modern jazz mainstream and created a sound and a style to go with it. What is most unusual is that he did not even approach the instrument until he was 28 years old, and he did not play a gig under his own leadership or record an album until he was 29. Born in Norristown, Pennsylvania on December 8, 1926, Jimmy studied piano from his father and later attended the Orenstein School of Music in Philadelphia for three years, studying piano, bass, harmony and theory. 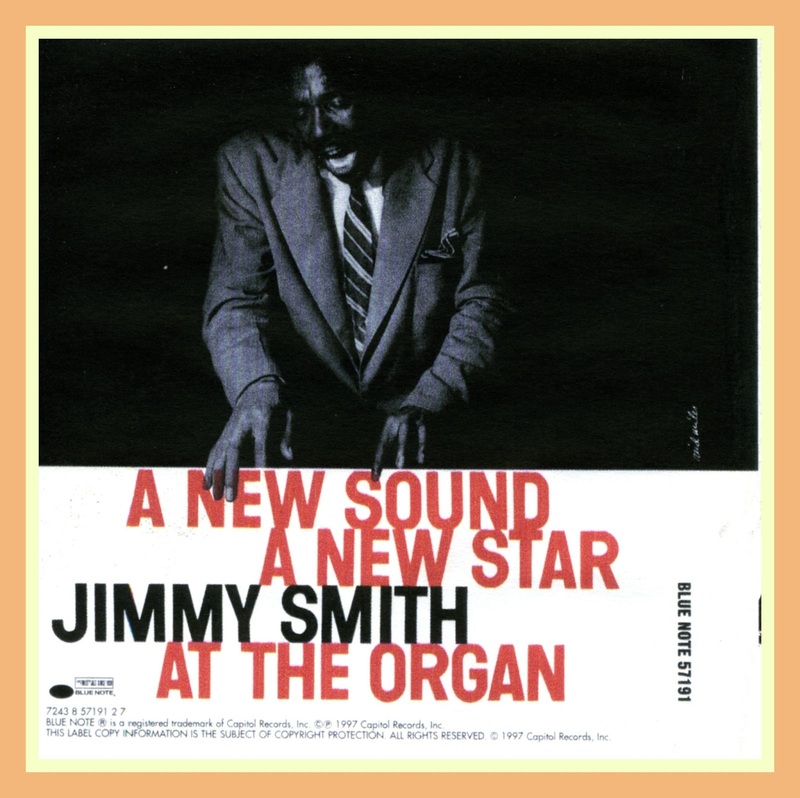 A succession of R&B gigs followed until 1955 when Smith began considering the possibilities of the electric organ, having been inspired by the work of Wild Bill Davis. He made a deal with a Philadelphia organ dealer to play on one of their organs at one dollar an hour until he could afford to buy his own. When he did buy his own instrument, he housed it in a warehouse near his residence and worked out conscientiously everyday, systematically teaching himself the instrument's capabilities and possibilities. After a year of sweat, he emerged with a style all his own and a facility that could be described as nothing less than complete virtuosity. 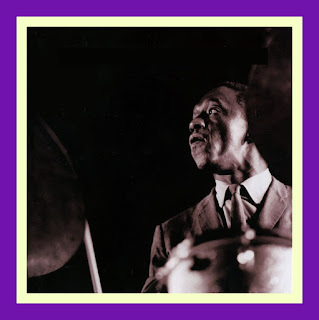 He formed his first trio with guitarist Thornel Schwartz and drummer Bey Perry. Word of this phenomenon came up to New York via musicians such as pianist Freddie Redd who happened to catch Smith while traveling through Philly. A few initial gigs in New York, uptown at Small's Paradise and downtown at Cafe Bohemia, and this man playing organ was literally the talk of the town. Alfred Lion of Blue Note was quick to check him out and even quicker to sign him. And from his first sessions, which included "The Preacher" and "The Champ," Jimmy Smith's records were commercial ana artistic hits. Smith recorded for Blue Note from February 1956 to February 1963. And the label put him in a variety of settings during those seven years. 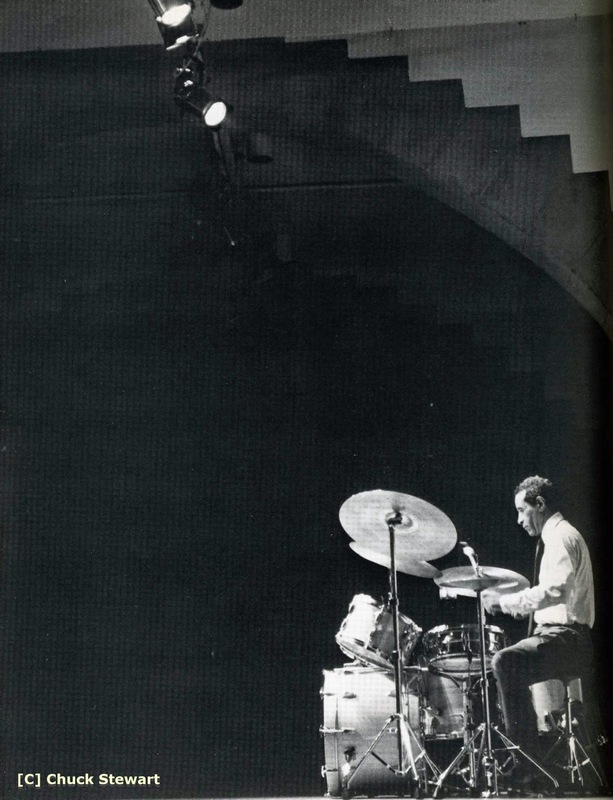 He recorded with his working trio, with singers Babs Gonzales and Bill Henderson, with rhythm section guests Kenny Burrell, Art Blakey and Philly Joe Jones, in quartet setting with Lou Donaldson or Stanley Turrentine and with all star sextets that included Lee Morgan, Curtis Fuller, Tina Brooks, Hank Mobley, Donald Byrd, Blue Mitchell, Jackie McLean, Ike Quebec and many others. 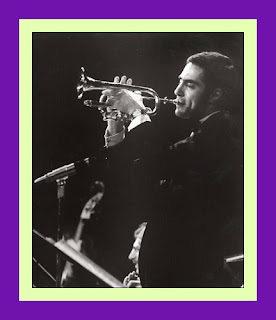 He seemed to shine most on live recordings and dates with an assem­blage or challenging horn men. In this album, we have both. Small's Paradise, the legendary Harlem club at 135th Street and 7th Avenue, has contributed to the history of jazz since the twenties. It has special significance to Smith and his relationship with Blue Note. The late Frank Wolff, Alfred Lion's partner in Blue Note, wrote, "I first heard Jimmy at Small's Paradise in January of 1956. It was his first gig in New York— one week. He was a stunning sight. A man in convulsions, face contorted, crouched over in apparent agony, the fingers flying, his foot dancing over the pedals. The air was filled with waves of sound that I had never heard before. The noise was shattering. A few people sat around, puzzled, but impressed. He came off the stand, smiling, the sweat dripping all over him. 'So what do you think?' 'Yeah,' I said. That's all I could say. Alfred Lion had already made up his mind." Jimmy Smith reveled in the expanded soundscape provided by Oliver Nelson’s big band arrangements as you can hear in the following audio track with its evocative version of Walk on the Wild Side, Elmer Bernstein’s theme from the film of the same name. Click on the “X” to close out of the ads. 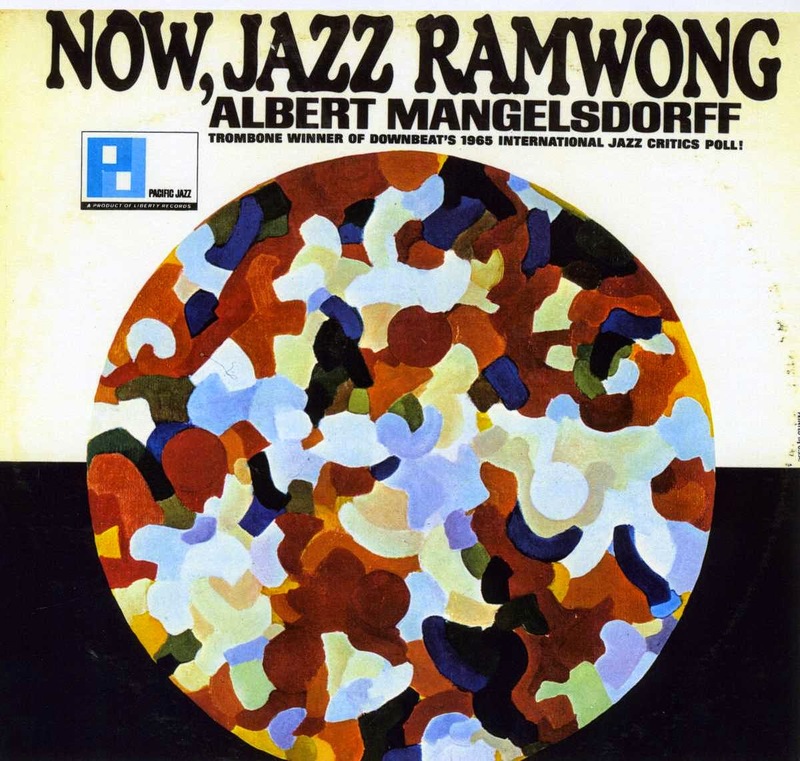 Albert Mangelsdorff - "Now, Jazz Ramwong"
"A new album by Albert Mangelsdorff, A Jazz Tune I Hope (MPS), recorded in Germany in 1978 with Elvin Jones, Eddie Gomez, and Wolfgang Dauner, shows that overtones can be eventually assimilated in a rather orthodox jazz setting. He uses multiphonics to build up the themes, for rhythmic chording, and to simulate strumming. Most impressively, he uses them to color his solos, to amplify without distracting from the linearity of his ideas." 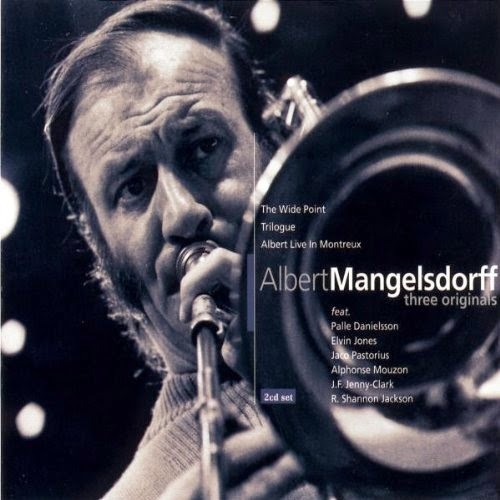 In many ways, trombonist Albert Mangelsdorff [1928-2005] was the virtual inventor of modern German jazz. His post-war recordings make it possible to trace the emergence of a distinctive idiom, rather than a mere copy of British and American models. Whatever the context, Mangelsdorff always managed to sound both absolutely responsive and absolutely himself. 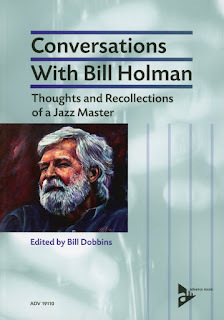 He was one of the great masters of his instrument, a pioneer in multiphonics, free playing and virtually any other context he's put himself in; but as far as recordings go, the price for that versatility seems to have been a discography which has never been firmly in print and available. At the moment, virtually nothing from his early years is easy to find which is why I thought perhaps it might be fun to revisit Now, Jazz Ramwong [Pacific Jazz PJ-10095], the recording through which I was introduced to his music. The initiative for the tour came from Joachim Ernst Berendt who has long been occupied with Asia music, and who accompanied the quintet through Asia. Some of the many themes and songs from Asia’s rich musical traditions which Berendt collected on a previous Asian trip can be heard in Jazz versions on this record. Therefore, it is only fitting and proper that he gives us a first-hand report on Albert Mangelsdorff in Asia and the music on this record. “Asia has all of a sudden become interesting to jazz musicians. Yusef Lateef, Tony Scott, Ornetle Coleman, Cal Tjader, Ahmed Abdul-Malik, Gerald Wilson, McCoy Tyner, Bud Shank, Horace Silver, Art Blakey, Cannonball Adderley and many others have begun to use Asian themes or elements and sounds of Asiatic music. But many of them have done so only superficially. If the rhythm is supposed to be "exotic," it only too often becomes Latin American completely ignoring the fact that South America is just as far from Asia as the United States. Why then an "Asiatical" theme? The Asian musician who most fascinates Jazz musicians is the famous Indian composer and sitar soloist Ravi Shankar -a soloist who ranks along with the greats of this century, an Artur Rubinstein or Charlie Parker. Bud Shank played with him, John Coltrane and Yusef Lateef have studied his recordings, and Gerald Wilson has dedicated a big band number to him. In view of this interest on the part of so many Jazz musicians, it is surprising that up until now there have only been single “Asiatic numbers” scattered around on various LP's. Albert Mangelsdorff was commissioned by the German Goethe Institute to travel to, and play in, many of the countries of Asia, from Turkey to Tokyo. He gave concerts in Iran and and Iraq, in India, in Pakistan, Burma and Thailand on Ceylon [Sri Lanka] and the Philippines, mMalaysia, Hong Kong and in Vietnam -a total of 50 performances in 65 days! Albert's impressions of Asia are as many sided as its music - and that is even more diversified than the music of Europe. Asia is rich in magnificent musical traditions. The Indian and the Chinese music traditions are at the center of Asia's music; on the periphery there are the Arabic-Mohammedan (which extends into India), the Indonesian (with Bali as its center) and the Japanese. In Indo-China, where the two main cultures overlap, Thailand, Cambodia, and Vietnam have also developed splendid musical traditions. All of these musical traditions have one thing in common, there is no harmonic structure. And that is exactly the reason they have become so important for jazz. The jazz musician of the 60's will, on the one hand, break out of the “harmonic tomb” of European music; but on the other hand, he wants to avoid the cold abstraction of the 12-tone or serial music. Asia is a perfect alternative! It is not without reason that the most interesting numbers on this record are based on "scales," in the manner in which these are used by Miles Davis and John Coltrane. The improvising is "free," is "modal," and not restricted by any harmonic framework. All this is particularly clear in The Theme from Pather Panchali by Ravi Shankar. I first heard this theme from Ravi in 1962 in the north Indian city of Jaipur when I saw the famous Indian film "Pather Panchali." Immediately after seeing the film, I bought the record and brought it along for Albert. Ravi Shankar took the main theme of the film from a Bengali folk song. 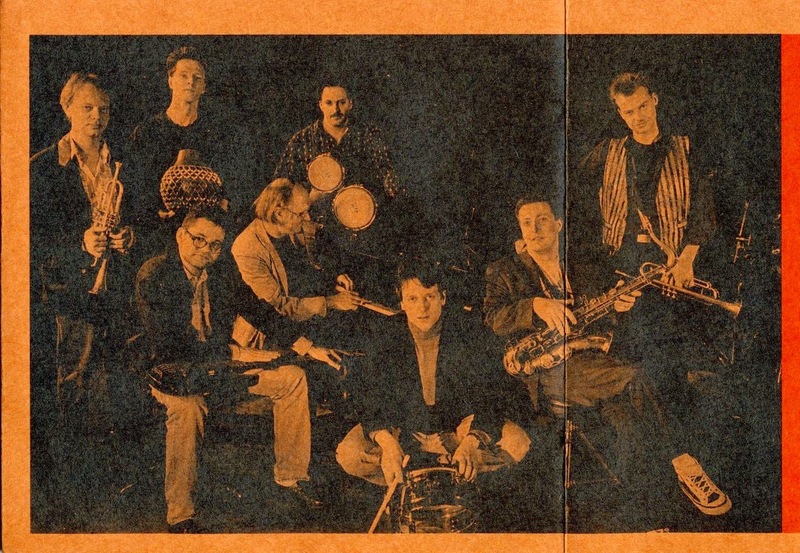 Albert begins by presenting it in its original form, then Heinz Sauer on tenor sax, Gunther Lenz on bass -drawing Indian sitar sounds from the instrument - and Gunther Kronberg on alto vary it in three different “moods.” The moods are definitely Jazz moods, but they also conform to that concept of mood which Indian music defines with the word "raga." It is almost impossible to explain to a Western listener what a “raga” is: it is simultaneously theme, scale, mood, and melodic sequence. We didn't meet Ravi Shankar personally while in India, but he was told about the jazz variations on his Pather Panchali theme. He thereupon had the quintet invited to his Ravi Shankar Music School in Bombay. From New Delhi we flew to Thailand, the only country in the world which has a king who is also a jazz musician. King Bumiphol received us in the inner circle of his royal household, where even the ladies in waiting understood something about Jazz. He first listened to a concert by the quintet, and then called for his own royal Jazz sextet, and then proceeded to hold a jam session with Albert's men. I have seldom seen Heinz Sauer so charming; he forgot about his own musical concept and-in order to correspond to the king's style-tried to play a la Coleman Hawkins. The number which made the greatest impression in Bangkok was a jazz version of the ramwong. The ramwong is the most popular Siamese folk dance which the girls in Thailand dance with graceful and acrobatic motions of their turned up fingers. The Bangkok Post wrote on January 23, 1964: "The quintet did a marvelous job transforming the folktune...."
The ramwong which Albert chose to play is called in Thai "Nau Djay Ramwong," but because Albert was "making jazz out of it now," he called his version — much to the amazement of the Thais -Now Jazz Ramwong. It's an Asian My Favorite Things, ideal evidence for our thesis that it is in free improvisation that modern jazz and Asia meet. Albert plays a German folk song from a time when many of our songs were "modal"- 13th century. Song Of The Three Angels (Es Sungen Drei Engel) was originally a fighting song and grew out of the battle against the Mongols on the Lechfeld Plain. However, as I noticed when announcing the concerts in Asia, because Germany has now become a prime peace loving country, it has come in the meantime to be sung as a Christmas Carol." Paul Hindemith wove the song into his opera "Mathis der Maler." Roland Kirk and Benny Golson took it from the opera with the mistaken idea that it was an original theme by Hindemith. At first Albert didn't take to the theme at all: "It sounds too much like Christmas." 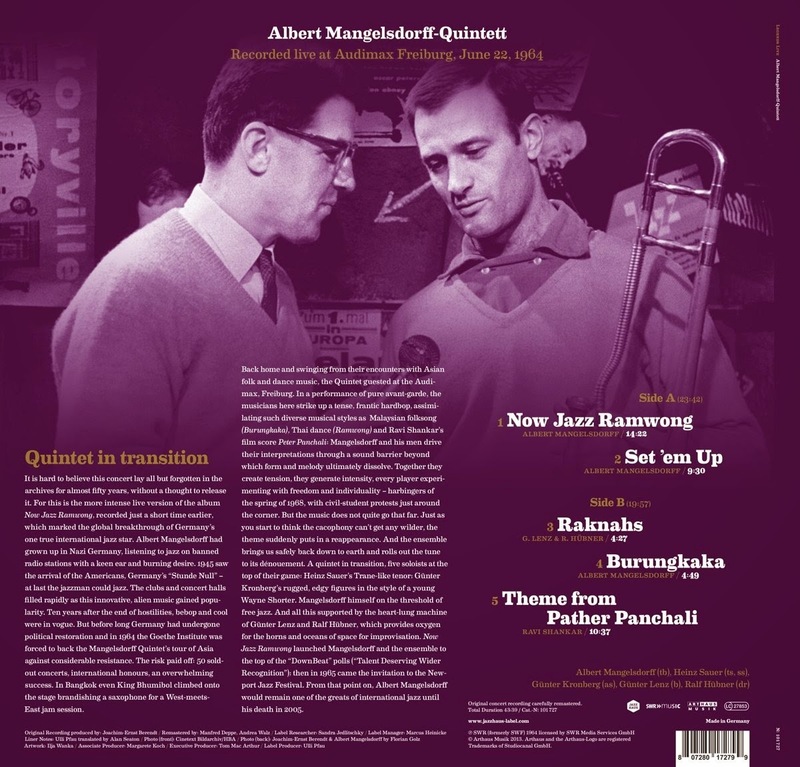 But then, over the course of many months, he transformed it into a piece of music completely his own - a kind of "Old-German soul waltz” complete with all the collective improvising so typical of Albert Mangelsdorff. He says about it: "We forget about the angels. I'd much prefer to call it Song Of Us Three. Heinz Sauer contributed a very effective original composition entitled Club Trois which along with Albert's original ballad, Ballad For Jessica Rose, Blues Du Domicile, and Set 'Em Up, constitute material that was part of the group’s repertoire before the Asia tour. Stanley Turrentine: Texas or ... Pittsburgh?